When we arrived at Paige and Zach's apartment in Connecticut a few weeks ago, she had a big container of this autumn snack mix sitting out. Having been up since 4:30 am to catch our flight, we were more than due for a snack. At the risk of spoiling our lunchtime seafood feast, we dug in. Ten handfuls later, I told myself I really better stop. After all, I needed room in my stomach for clam chowder and a lobster roll! Five handfuls after that, I finally managed to tear myself away from the stuff. We still managed to find room for all of that seafood, but if there was ever a snack to spoil your meal on, this is it! 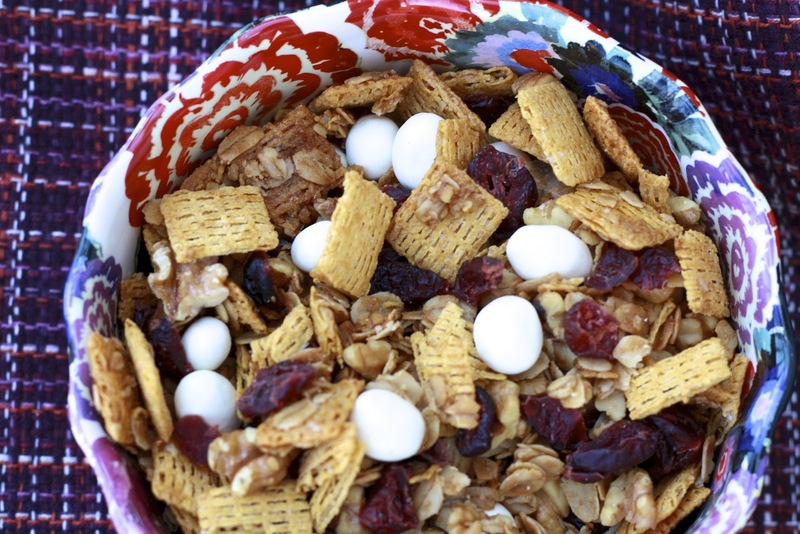 The snack mix is the perfect combination of textures and flavors. It manages to be both crunchy and chewy, my favorite bites being those with chunks of life cereal and oats stuck together! If you're really feeling wild, throw some chocolate chips in there too! 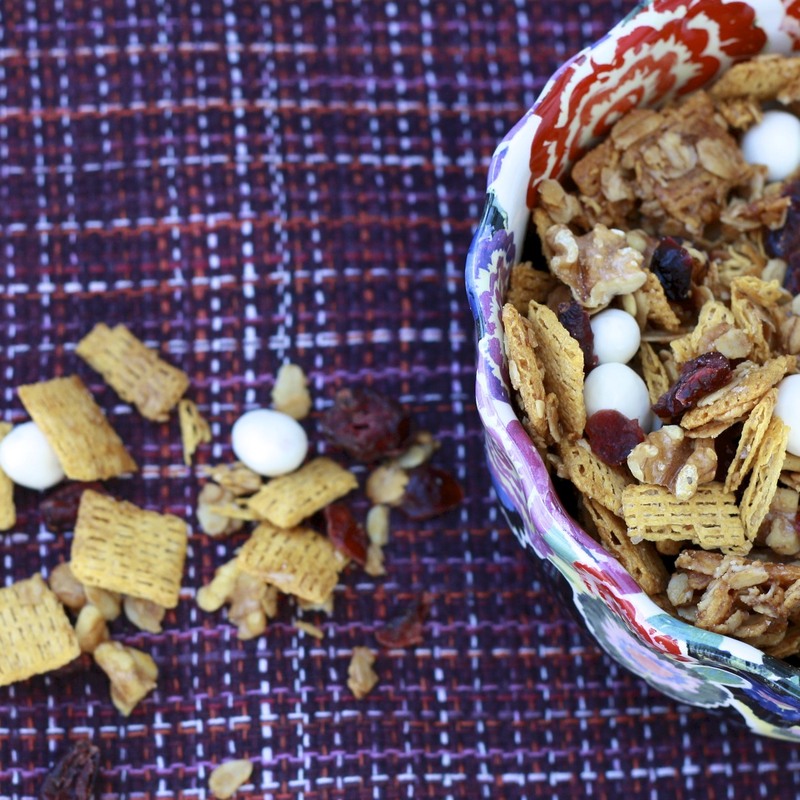 Despite its title, this is one snack mix I could see myself making year round. Less than a week after returning home from our trip, I had already whipped up a batch in my own kitchen and I have enough of the ingredients left over to make another batch soon. Bring it to a Halloween party this weekend or whip some up to eat during the football games! 1. In a small saucepan over medium low heat, add butter, honey, brown sugar, cinnamon, and salt. Stir until butter is melted and sugar is dissolved. 2. 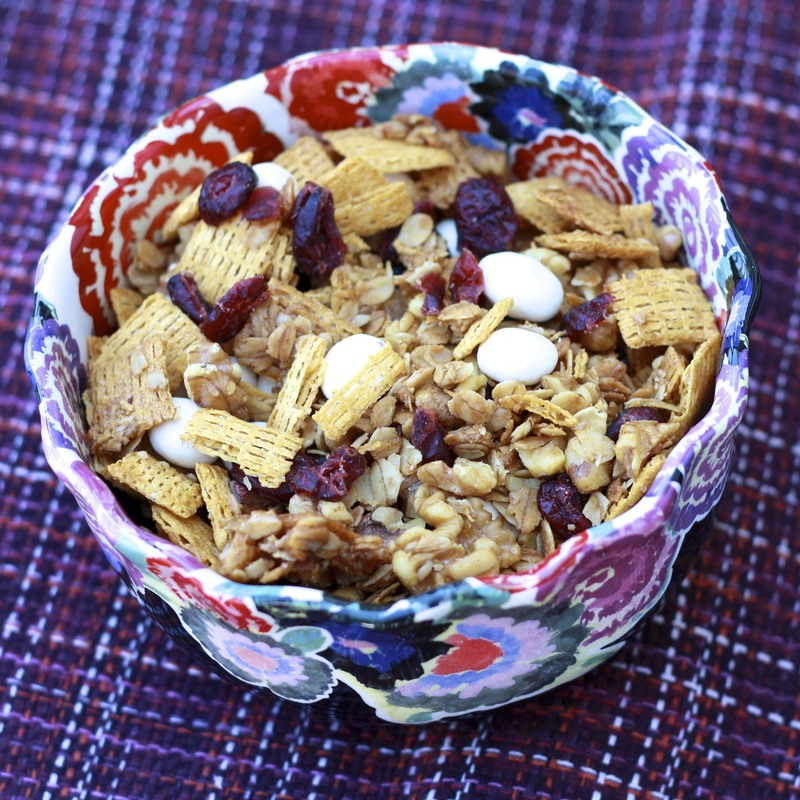 In a large bowl, combine cereal, oats, and walnuts. Pour butter mixture over the cereal and toss with a spoon to evenly coat. 3. Pour mixture out on a greased 15 x 10 inch rimmed baking sheet. Bake at 275F for 45 minutes, stirring after every 15 minutes. Remove from oven and allow to cool for 15 minutes, stirring occasionally. 4. Place mixture in an airtight container along with dried cranberries and yogurt covered raisins, stirring to combine.